Canela Lemoine created this sweet sterling silver piece for adoptive mothers and their children. "This necklace is a tribute to my parents and all parents who have struggled and fought and given up so much to bring a child in to their home as their own to love." That's a quote from Canela Lemoine, who created this sweet piece for adoptive mothers and their children. 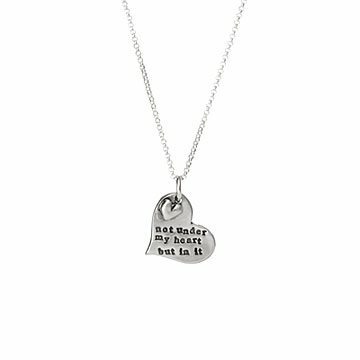 She casts the heart in sterling silver, inscribing it with these sentimental words: "Not under my heart, but in it." It's a tribute to the idea that family isn't something we're given, it's something we find. Handmade in California. Pendant: 1" Dia Chain: 18"
This is another way to give tribute to a most loving , most caring person I know - MY MOM! Mom was proud to wear it.